This was the second sailfish on fly for the day. 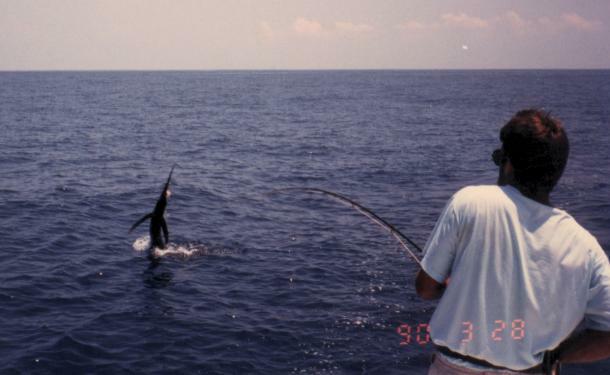 Jumping in the distance, I fight this very tough sailfish on fly for two hours. It fought like a blue marlin. It would "greyhound" across the surface for 50 yards then sound and fight hard for 30 minutes, then back up to "greyhound" again and sound again. It did this four times before I had to break it off before sunset. Close to sunset I break him off so we can get back to Quepos, but we get caught by a big storm just offshore. It was a perilous run along the shear cliffs at night. where if it were not for the lightning we my have been wrecked. This was in the day before GPS and no loran beacons in C.R. 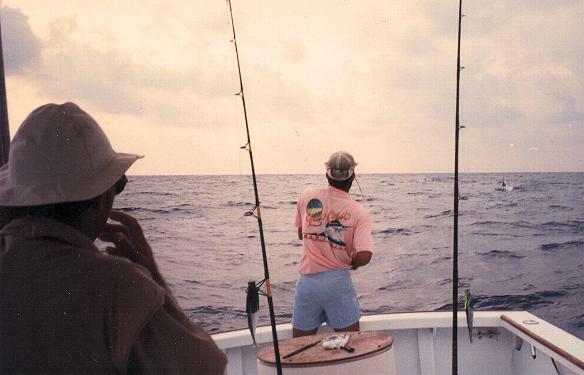 Here I catch my first sailfish on fly. Now I had already guided several anglers to sailfish on fly. A total of 13 sailfish on fly I've guided anglers too (all their first sailfish on fly), which I'd like to continue here in Islamorada.